The WEX PASSPORT TRAVEL WALLET, A Handy passport wallet covered with arrival stamps and with various pockets to hold your passport, visa photos, credit cards and other documents. Whether its the frontiers of Eastern Europe or some remote island nation in the Pacific , your WEX PASSPORT TRAVEL WALLET will look stylish and give you something to talk about on those lonely nights in Antarctica. Free shipping! 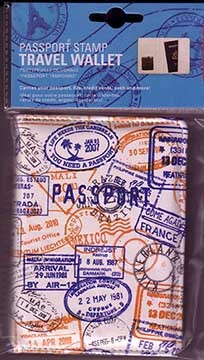 WEX PASSPORT TRAVEL WALLET, A Handy passport wallet covered with arrival stamps and with various pockets to hold your passport, visa photos, credit cards and other documents.